Precision Medical Technologies, Inc. has the technical expertise to manufacture implants for all orthopedic applications. However, areas of particular expertise and focus for us are the spinal, extremities and trauma markets. 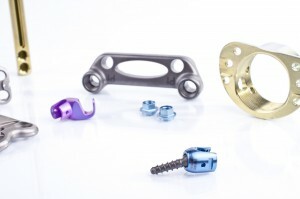 Leading OEMs rely on Premedtec to provide implants as well as custom products to their surgeons. Our team of dedicated manufacturing engineers and machinists employ state-of-the-art technology to produce the most exacting implant devices. Premedtec’s design for manufacturability and prototyping capabilities are supported with Mastercam CAD/CAM software that is Unigraphics and Pro-E compatible. Precision Medical Technologies, Inc. works with a wide variety of materials, including cobalt chromium, titanium, stainless steel, super alloys, silicone, and engineered plastics. Precision Medical Technologies, Inc. has a full complement of Wire EDM, Horizontal and Vertical CNC and Swiss Turning Centers. El Dorado M75-30, ¾” Ø with Tailstock and Counter Rotation.